Stand Up Paddle – A fresh addition to your wellness routine! Our Paddle Group sessions boost mental health and are the ultimate core strengthening /cardiovascular workout. SUP is one of the few exercises where your body actually calms down, rather than stresses as you step off the shore and reconnect with nature. Guaranteed glowing skin, increased vitality, improved balance, flexibility and confidence. Cost: $30 or $15 if you bring your own board. 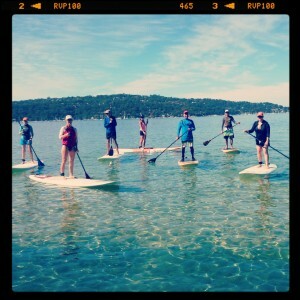 A SUP Experience is the prerequisite mini lesson for entry to one of the Paddle Groups. We paddle between 5 to 7km’s, often have a swim at one of the many secluded beaches in Pittwater. The duration of a Group Paddle is between 60 to 90 minutes.